In this in-depth review of the best singer featherweight sewing machine, we will take a close look at the Singer Featherweight C240 Handy Sewing Machine. 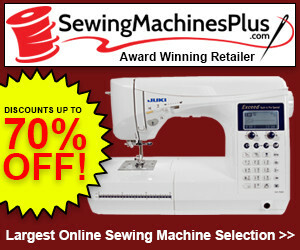 This way you can decide for yourself whether or not it truly is the best Singer featherweight sewing machine. The smoothly contoured outline of the machine gives it an inviting look. The gentle curves make it look very user-friendly and intuitive which it really is. The pleasing contemporary design reflects the right qualities of the sewing machine. The Singer Featherweight C240 Handy Sewing Machine comes with Integrated Even Feed technology. With the help of this innovative technology, you can sew different types of fabrics including bulky seams and multiple layers so that they will be perfectly aligned at the end of the seam. 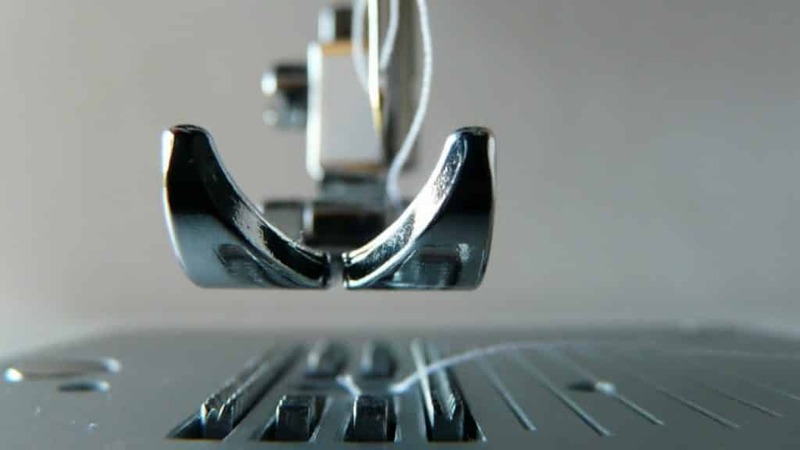 You don’t need to worry now about poorly done seams thanks to the IEF technology. You will not have to put up with seams puckering if you use silky or lightweight fabrics. While sewing quilts, you can enjoy peace of mind since this technology will not allow the layers to shift relative to one another. You can sew plaids and stripe pattern fabrics perfectly so that the lines are properly aligned. With this feature, you can now craft runway ready attire, beautiful quilts, and gorgeous home décor with maximum ease and convenience. The advanced feed mechanism is one reason why this model is one of the best Singer featherweight sewing machines. Although the Singer Featherweight C240 Handy Sewing Machine is light in weight, it is certainly not light in stitching options. The sewing machine is designed to produce 70 stitch patterns. These built-in stitches will cover any stitch pattern that you want. These patterns are printed within the lid of the sewing machine. It is now easier than ever to find the perfect stitch that takes your fancy. You have a wide range of stretch stitches, basic stitches, appliqué stitches, quilting stitches, decorative stitches, and 3 buttonhole types to choose from. You can make your projects amazing by choosing one of the many wonderful stitch patterns. Embellish your fabrics with unique stitch patterns for a unique decorative effect. Pin stitch appliqué has also been included. The stitch quality is both consistent and reliable because of the robust feed mechanism. You will, therefore, not face the annoyance of skipped stitches. All of your creations can now be graced with professional quality stitching. With such reliable stitching and so many stitching options, it may be regarded as one of the best Singer featherweight sewing machines. Adjusting the stitch width and stitch length is very easy. You only need to turn the dial to set up the stitch length and width that is most appropriate for your purpose. For instance, you can set the stitch width to a maximum for a bold and pronounced stitching pattern that stands out. You can easily adjust the tension in your thread by turning the dial for thread tension. You can use this very simple feature to modify tension according to the thread and fabric type that you are working with. This way you get tight and even stitches that are just right. You can use this button to shift your needle upwards or downwards so that you have the most suitable stop position for your needle. This feature is very handy for attaching pockets, appliqué, free-motion sewing, and other sewing tasks. You can reveal the free arm of the machine by taking off the extension table which is easily removable. This will make it much simpler for you to sew sleeve cuffs, trouser hems, and other similar projects. The Singer Featherweight C240 sewing machine is sleek, compact, and highly portable. At just under 15 pounds, it is lightweight and perfect for being taken to your sewing classes. The lightness and diminutive size of this machine make it ideal for those who have to travel often. Due to the protective hard cover, it can be easily kept in your vehicle without any fear that it may get damaged. If you fancy sewing with your friends, then you should consider this machine since it is highly portable. The handle on top makes it particularly easy to carry. Due to its compact dimensions, it can be easily used in restricted spaces. It can also be stored easily because it is very small in size and won’t take up much space. The dust cover will protect the sewing machine when it’s not in use. Although the machine is very light and small, it can also handle thick fabrics and is also capable of sewing beautiful quilts. You can now make the most inspiring quilt designs and express your own creativity. You can easily attach and remove presser feet according to your sewing needs. Six types of presser feet have been included: all-purpose presser foot, general purpose foot, blind hem foot, satin stitch foot, buttonhole foot, and zipper foot. These presser feet work in conjunction with IEF to give you the best and most consistent seams. The presser foot can rise up to about 3/8 inch. This will prove sufficient even for quilts with batting. It can also efficiently sew multiple denim layers and therefore, capable of hemming jeans. By adjusting the lifter for the presser foot, you can get a clearance of almost half an inch. You must take the lifter to its topmost position in order to create this space. The machine is intuitive and easy to use, thanks to the color coding scheme that displays bobbin and needle threading paths. This provides a handy reference so that you can start using the machine immediately without having to wade through boring and tedious manuals. The machine can be set up quickly for use even by beginners. The Info button will indicate a couple of useful hints like which stitch patterns can be created with the help of IEF feature and which feet must be used. The machine can operate at a maximum speed of 600-700 stitches per minute. This speed is not particularly high and will be of greatest advantage to those who don’t need a sewing machine for industrial purposes or very high volume sewing work. You will not face problems using the foot pedal because the top speed is not very high. So, you can enjoy greater control which will lead to error-free work. Beginners will also appreciate this very much. You can also vary this speed from minimum to maximum with the help of the speed controller. By default, the machine will work at the lowest possible speed. If you want to increase this speed, you will have to adjust the speed controller. Without this, the machine won’t run very fast even if you fully press down on the foot controller. Experienced seamstresses and tailors will appreciate the fact that the sewing machine does not vibrate like other lightweight sewing machines. This sewing machine has been well-designed. So, it works smoothly and is fairly quiet. This is something that almost everyone can appreciate. This machine can also be used for tricky stretch fabrics that are a bit harder to sew compared to other fabrics. Although stretch fabrics are very comfortable and flexible, they do require a little skill to sew the seams in particular. You can now exercise much greater control over stretch fabrics with the help of the stretch stitch offered by this sewing machine. For instance, doing blind hems on knit fabrics is now very convenient with this machine. You can now sew dance costumes, swimwear, fun wear, custom gowns, and much more with stretch fabrics using the Singer Featherweight C240. In spite of being lightweight, the sewing machine can stitch materials like real leather, faux suede, and chiffon without associated problems like needles breaking, tears, and pucker formation. This can be attributed to the even feed system. The stainless steel bedplate has been designed for smooth fabric flow. No longer will you have to pause your work to rip out faulty seams and start all over again. You can also use the extended deck to comfortably handle large projects. Working with this machine will make it apparent that sewing can be really intuitive and fun and need not be a chore. The sturdy metal chassis is light yet robust. It provides plenty of strength at the core so that the machine will not skip stitches while sewing. The metal support is rigid enough to hold all the mechanisms in place at the right alignment for problem-free sewing. The heavy-duty metal frame will ensure that the sewing machine will operate reliably for several years to come. The bobbin is very easy and quick to insert since it is loaded from the top. You can also monitor your remaining thread supply, thanks to the transparent cover. With the two bright LED lights, you will have plenty of illumination even for late night work. This will minimize eye strain and make big projects much more enjoyable. The current model belongs to the highly revered pedigree of the Singer 221 featherweight sewing machine which has now become a prime collector’s artifact. The vintage model is compact and yet powerful, reliable, and fully functional. Sewing connoisseurs are fascinated by how quietly and smoothly this old timer works. Provided you use the right needle, there is no fabric that it cannot vanquish. Originally designed in 1933, production of this machine continued up to 1968 without substantial redesign. No other sewing machine model has enjoyed such a long production time period without a major redesign. This is definitely one of the most iconic and classic sewing machine models. The Singer Featherweight C240 sewing machine is a worthy successor of the tremendously successful vintage model. The good thing about this machine is that it offers the right mix of the most useful features without being overly complicated. You can, therefore, use this machine with convenience for most of your sewing projects. The Singer Featherweight C240 sewing machine will prove to be a dependable sewing companion for many years.